Listen to the shocking story that the media have ignored and covered up. 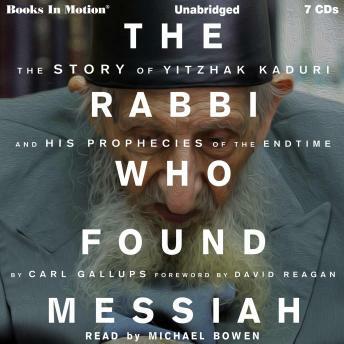 In 2007, two Israeli news publications, Israel Today and News First Class reported that the most famous Rabbi in Israel's modern history, 108-year-old Yitzhak Kaduri, had left a cryptic death note revealing the name of the long-awaited Messiah. Within a year after the rabbi's death, the note was reported to have been verified as authentic by some of Kaduri's closest followers and then placed on Kaduri's own website (Kaduri.net). The purported Kaduri message proclaimed that Messiah's name was Yehoshua, or Jesus. Its significance shocked the religious world. Shortly thereafter the furor began. The note immediately disappeared from Kaduri's website. The media refused to report further upon the matter. The Kaduri family, and several others close to the Kaduri ministry, began to claim that the note was a forgery or a mere fabrication - a cruel joke. Now, author, senior pastor, radio talk show host, and former law enforcement officer Carl Gallups, uses his biblical knowledge and journalistic and investigative skills to explore the matter inside and out. Gallup's exciting detailed reporting reaches startling conclusions that will amaze you. You will be blessed when you listen to this book. The late Rabbi Kaduri had much wisdom, and one of the few that had the rich blessing to meet Jesus Christ Himself. Except Jesus now before His wrath comes down upon those that are mocking Him.